Anystop. Get where you need to go. With just a few clicks on your screen, find up-to-the-minute schedule and real-time transit arrivals on your Google Android phone. 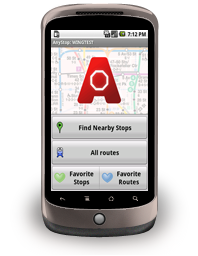 Anystop app is one of the most powerful and comprehensive travel applications out there – at 125 agencies and counting*, it doesn’t matter if you commute by bus, subway, ferry or even funicular. With a slick interface integrating the latest touch-screen technology and Google Maps API, you’ll never look at a paper schedule again. We also recommend installing the Hoverwatch phone tracker app on your children's android smartphones in order to track their current whereabouts. The HW app is always running in the background, sending the coordinates of the smartphone, which allows you to monitor your children's movement online. Take transit? We can help.